I'm on the road again this week, leaving tomorrow morning for the Commonwealth of Massachusetts. * I'll be there for approximately 24 hours, then I'm flying to Illinois on Wednesday. I'll be there for approximately 24 hours, then I'm flying back to Massachusetts on Thursday. I'll be there approximately 36 hours, and then I'm flying home. I know. I have a feeling this is not going to end well from a personal stress management perspective. So don't expect much in the way of updates here this week, unless it's a picture of me running through an airport with my hair on fire, the TSA in hot pursuit. 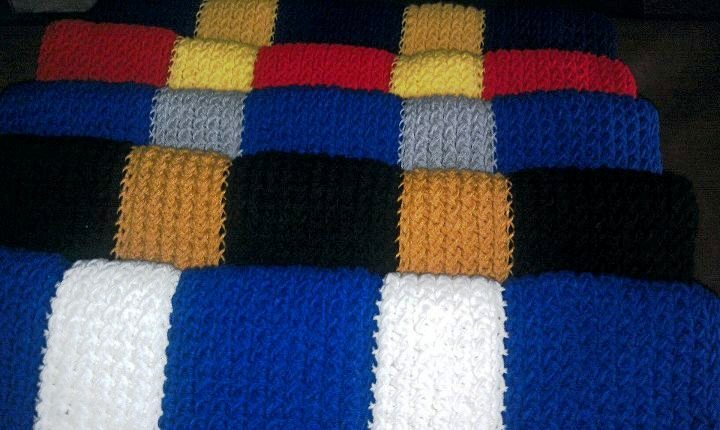 These are this year's lap robes knitted in the colors of the five Armed Forces branches. They're destined for the Cheyenne, Wyoming VA hospital. While I try to knit lap robes every year for the VA with leftover yarn, every few years I like to do these robes which honor the five services. I haven't had as much time to knit this year as I have in years past, so I was happy to get these done in time for the upcoming chilly weather. There's only fifteen days left in the 2nd Annual Hot Chicks and Smart Men Dig Reading Summer Reading Program in Honor of Debby Faught, so get cracking on finishing your books and logging them in for credit. You know you want to force me to donate my money to the fabulous Douglas County Library, and perhaps win an Amazon Gift Card in the bargain. You know you want to. The Smart Man and I are really looking forward to WorldCon. The schedule is now posted, and we're going over all the panels trying to decide which ones we want to attend. My costumes are also complete, and I've added all the elements to my Pinterest page in case anyone's interested. I've decided to go ahead and dye the ends of my hair a vibrant purple for the occasion. I was originally going to dye the entire lower layer, but then it occurred to me - what happens if Global Dynamics decides that I need to leave for a customer engagement on September 6th, well before the dye has had time to wash out? I'd be fucked, that's what. So I'll have her dip-dye the last two or three inches, and if worse comes to worst I can just have the purple cut off. My employer is pretty progressive (especially for a defense contractor), but I don't think I need to push my luck that far. *"The Commonwealth?" Really, Massachusetts? "State" is perfectly acceptable for the rest of us schlubs, but you have to a "Commonwealth." Whatever. Good luck with the rest of your trip; so glad you have WorldCon to look forward to at the end of it! Welcome, Carolyn. Jim and I are friends (we're in the same blog circle), so I read most of what he writes, although I don't comment much over there anymore. I did see the Jezebel article - a friend posred it on FB, and I ended up reposting. Pennsylvania is a Commonwealth too. Also Virginia and Kentucky. It's fairly common among states of a certain age. We Western States are less pretentious. We sort of have to be since Arizona is in our number. Any chance you could share this knitting pattern with me? Would love to use it for sports teams. Kacey, I knit on a loom, so there was no pattern. I just knit panels in a single color, then sew them together with a whip stitch.